Pour into 12 (2-oz.) shot glasses or 4 small dessert dishes. Substitute softened ice cream or yogurt for the cold water. Prepare as directed, substituting cold carbonated cola beverage for the cold water. Prepare as directed, using JELL-O Orange Flavor Gelatin and substituting softened vanilla ice cream for the cold water. Prepare as directed, using JELL-O Raspberry or Strawberry Flavor Gelatin and substituting cold ginger ale for the cold water. Prepare as directed, using JELL-O Peach Flavor Gelatin and substituting peach- or vanilla-flavored yogurt for the cold water. Prepare as directed, using one of the following flavor options: Orange Cream Shots: Use JELL-O Orange Flavor Gelatin and substitute softened vanilla ice cream for the cold water. Gingerberry Shots: Use JELL-O Raspberry or Strawberry Flavor Gelatin and substitute cold ginger ale for the cold water. Tangy Peach Shots: Use JELL-O Peach Flavor Gelatin and substitute peach- or vanilla-flavored yogurt for the cold water. 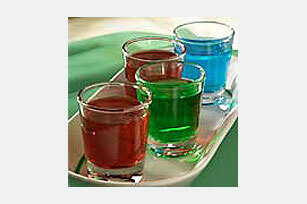 Cherry Cola Shots: Use JELL-O Cherry Flavor Gelatin and substitute cold carbonated cola beverage for the cold water. Substitute your favorite flavor fruit juice for the cold water.